Social media started to be used in public administration in the 1990s. After the Web 2.0 tools impacted government websites, the new trend of Facebook, Twitter, YouTube, and Instagram were implemented in home pages. However, very little is known regarding the consequences of these new technologies and their relationship with citizens and public officials. 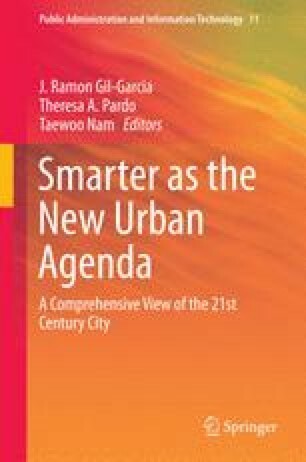 The focus of this chapter is to understand the link between social media and smart cities. Since citizens use information technologies to communicate, collaborate, and interact, these same activities can be used in smart cities. In order to understand this linkage, we developed a questionnaire based on two different but complementary frameworks related to social media and smart cities and interviewed the chief information officers (CIO)’s of eight cities in the State of Mexico. Our findings reveal that social media tools are immersed into the smart cities’ practices. As a consequence, they are bringing changes in the departments, systems, and relationships among internal agencies. If social media tools are going to be used, then important issues such as inclusion, empowerment, and information quality need to be addressed.